Here you'll find answers to the most common questions about LapGuru. What are the infrastructure requirements in order to use LapGuru? You need a VGC to transmit a live surgery. If you are a viewer on LapGuru, you will not need a VGC. A unidirectional microphone is needed if a group of people is interacting through a single mic and common speakers. If you use LapGuru to train a group of surgeons, use a unidirectional microphone to speak. Otherwise, the sound from the speaker interferes with the microphone and echoes your voice. If the video is getting transmitted at a bandwidth higher than that of viewer’s available bandwidth the viewer may experience jerky or choppy video. Ideally, the viewer needs to have same download speed as that of the uploading speed of the transmitter. You can transmit a SD quality video with a bandwidth of around 500 kbps. For SD+ quality transmission one needs upload speed of 2Mbps, and for HD transmissions, bandwidth of 4Mbps will be required. Higher bandwidth improves the quality of the transmitted video. To check the speed of your Internet connection, visit http://www.speedtest.net and click Begin Test. LapGuru is best viewed in Mozilla Firefox browser. To download Adobe® Flash® Media Live Encoder, visit https://www.adobe.com/cfusion/entitlement/index.cfm?e=fmle3 or http://www.videohelp.com/tools/Flash-Media-Live-Encoder. Flash Media Live Encoder will be needed only for transmitters who are going to transmit the live surgeries. The same is not required for viewers, who are just going to watch the surgery videos. Do I need to have a Video Grabber Card to watch the surgery transmission? No. 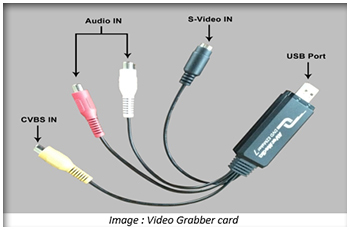 A video grabber card (VGC) is required only if you wish to transmit the video of live surgery. It is basically needed to interface your Laparoscopic / Endoscopic Camera with the computer/laptop. If you just need to view the surgery transmission, then the grabber card is not required. Can I use the inbuilt speakers and microphone of my laptop for communicating with other surgeons? The sound from the speaker interferes with the microphone and echoes your voice, thus disturb others. Hence using a separate headphone and microphone is preferred. A studio grade microphone provides the best quality sound. 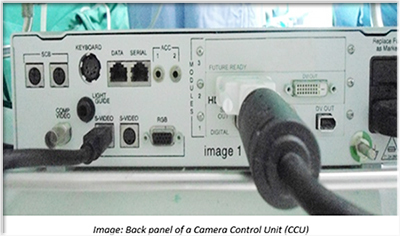 How to connect Laparoscopic / Endoscopic Camera Control Unit (CCU) to the computer? A USB Port at the other end which acts as an output. You must connect the USB port to the computer or laptop. 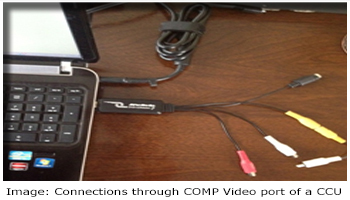 A CCU can be interfaced with the computer either by using the COMP VIDEO (Composite Video) or S-VIDEO outs. Connect the yellow pin (CVBS In) of the VGC to the COMP VIDEO port of the Camera. Connect the USB of the VGC to the USB of the computer as shown below. Connect the black pin (S-Video In) of the VGC to the S-VIDEO port of the Camera. Connect the USB of the VGC to the USB of the computer. Select the firewire cable that suits the firewire ports of the Camera (DV OUT Port) and your computer. Connect one end of the firewire cable to the DV OUT port of Camera. Connect the other end of the cable to the firewire port of the computer. HD videos can also be transmitted using a HD grabber card. In this case, HDMI out of a Camera Control Unit (CCU) can be connected to HD grabber, which in turn can be connected to computer through a Firewire or USB 3.0 port. I get good Internet speed on my desktop, however I do not get same kind of speed on the laptop. If the bandwidth is substantially more than before, make relevant configuration changes to the firewall and restart. If you have an IT team or IT personnel in your hospital, then please contact them for the same. Who can register on LapGuru Portal? Any Laparoscopic/ Endoscopic surgeon who wishes to watch videos of other Laparoscopic surgeons can register on LapGuru portal. Also any hospitals or medical institutes can become a member on this portal. All users, by default, are viewers. If you wish to transmit your surgeries please contact us on- support@lapguru.com . LapGuru is an information repository for the less experienced surgeons and a perfect platform for the experienced surgeons to share their knowledge. LapGuru has a number of registered surgeons who are available to answer queries during surgery if they are invited to the surgery transmission and where surgeons transmit the videos of their live surgeries for the other less experienced surgeons to watch and learn. Newly registered users are by default enrolled under Basic plan which is free. Other Viewership plans will be published soon on www.lapguru.com. Contact us on- info@lapguru.com for viewing premium content. Is registration mandatory to watch/transmit any surgery video? Yes. You must register on the LapGuru portal in order to watch the surgery video. Registration process is very simple and it hardly takes 2-3 minutes time. How do I become a member on LapGuru/ How to register on the LapGuru portal? The fields marked with an asterisk (*) are mandatory. You must type the information in these fields. Click Register. You will get a confirmation email from site.admin@lapguru.com on successful registration on the email ID you registered with on LapGuru portal. Store the email which you receive from LapGuru for your future reference, as the same will have your Login details. Do not share your user ID (email address) and password with colleagues, family, or friends. If they wish to use LapGuru, invite them to register. I have filled up the registration form and got a pop-up message saying You are successfully registered on LapGuru. We have mailed you the login details on your email. However, I did not get any email. Wait for 5-10 mins after completing the registration form to get the email from the LapGuru portal. Click Refresh button on your browser once to check whether you have got the mail. Check the Spam folder in your mailbox. Sometime, due to anti-spam settings, the mail may go into Spam folder. If you can see the mail in Spam folder, mark as Not Spam (so that the mail will be moved to your Inbox) or Add the user- site.admin@lapguru.com to your contact list. I do not remember the password which I had set for my LapGuru login. How can I retrieve it? Click on Request a new password link on the Login box that opens at the click of Login button on www.lapguru.com . Enter the email address which you had filled up while registering on the LapGuru portal. Once you enter correct email address, a new password will be sent to your email ID using which you can login into LapGuru portal. You may edit this password later by going to Edit profile page. I have a transmitter access on LapGuru. What is the procedure to transmit the video of my live surgery? For details on the connections, please refer Q. How to connect Camera unit to the computer? Start the FMLE. FMLE detects the input device (Video Grabber Card) that you have connected to your computer. You can see the VGC details in the FMLE window. From the Device drop down list, select the video device that you have connected to your computer as shown below. To configure this video device, click Video Capture Device Settings A new Settings window pops up. The Settings window enables you to configure the video device. On the Settings pop up window, select the Crossbar tab. 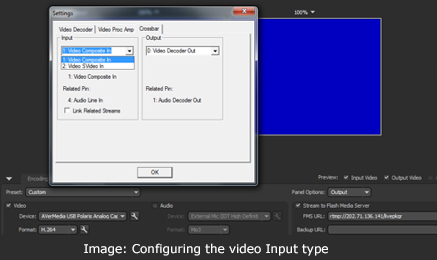 Depending on your computer – CCU connections, select either ‘Video Composite In’ or ‘Video S-Video In’ from the Input dropdown list. On the Settings window, select the Video Decoder tab. Select relevant Video Standard from the dropdown list. The FMLE now shows you the video from the Laparoscopic / Endoscopic Camera you are connected to. The FMLE settings are now complete. Close the window. Login to LapGuru portal- www.lapguru.com using your registered email ID & password. Fill in the required details in the form and click on Save button. The surgery schedule that you have created can be seen on the Live Surgeries tab. When you click on this button, the Flash player window will start. Click on Play button on this player and your surgery transmission will start. I want to transmit the video of my live surgery, but I cannot see any button/ link for scheduling a new surgery event. The number of users who can transmit the live surgeries has been restricted on LapGuru. If you do not have Transmission rights, you will not be able to see button and you can only view Live or Recorded Surgeries on LapGuru based on your membership plan. I had created a new surgery schedule. However I am unable to find the same on the Live Surgeries tab now. The surgery schedules are removed from the Live Surgeries tab once the date for which it was created is already passed. Hence if your surgery schedule was created for a past date, you will not be able to view the same on Live Surgeries tab now, and you will have to create a new schedule by clicking on button. The surgery schedules are removed from the Live Surgeries tab if the same does not start within 10 hours from its start time. I have created a surgery transmission for a particular date; however my plan is changed now. Can I make the changes in scheduled date & time for my surgery? You may click on Edit transmission , make changes in the date & time and click on Save. The changes that you made will be automatically reflected on Live Surgeries tab. Can I cancel/ delete a surgery schedule that I have created? Yes. You can click on Delete surgery transmission to cancel or permanently delete a surgery schedule that you have created. However, please note, once you confirm this action, you cannot retrieve the deleted surgery schedule back and you will have to create a new surgery event. I wish to broadcast my surgery on LapGuru. Can I provide restricted access for watching the same only to people I wish to invite to watch my surgery? Click on button, after logging to your LapGuru account. Send this code to the people you wish to invite to watch your transmission. Only such viewers will be able to connect to watch your private transmission. I would like to broadcast a conference having surgery transmissions from hospitals at multiple locations. Can the viewers watch all surgeries together? Go to Conferences tab after Login to your LapGuru account. Create a conference schedule by filling up details in the form such as, Conference title, Start & End Date, and add names of surgeons who are going to transmit surgeries under this conference by clicking on Select Conference access. The select conference access shows the list of current LapGuru transmitters. Once the conference schedule is created, the transmitting surgeons may add surgeries to that conference by clicking on button. Viewers will be able to see button under this conference schedule. When they click on the same, they will be able to watch all current Live surgeries on the single player page. The audio for each surgery will not be available on this conference page. However, viewers can go to individual surgery page to get all surgery details along with audio. I am able to transmit the surgery video; however the viewers cannot hear my voice. Please ensure that your microphone is properly connected to the computer. The Flash player automatically detects the microphone that is connected to your computer. In the Flash player window, Right-click and select Settings. Click Flash player should show the microphone that is connected to your computer. If the sound is ON, then it will show bars as per the intensity of the sound in the setting below. Click Select Allow and Remember. There is lot of disturbance in the audio and other surgeons cannot hear my voice properly. Using the inbuilt microphone of the laptop can create an echo and can cause a lot of disturbance to the other users. Do not use the inbuilt mic of your laptop instead use a separate headphone and microphone. I am showing the surgery transmission to a group of people in an auditorium. However, when I speak, there are multiple voices created and that creates a lot of disturbance. When the speaker is used to transmit audio (like in an auditorium) the user/ trainer should use a unidirectional microphone, otherwise, the audio coming from the speaker will be fed back to the mic and may create an echo. I clicked on Start transmission button however the video did not start. Please make sure that the connections between your CCU and the computer/laptop are properly done. 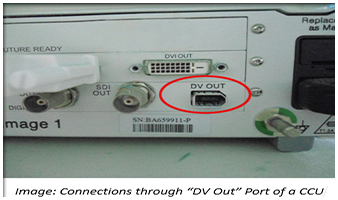 For more details about connections, refer How to connect Camera unit to the computer? 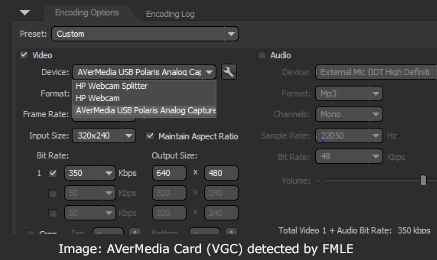 Start Flash Media Live Encoder (FMLE) and see whether the video from input device can be seen. For more details about FMLE settings, refer what is the procedure to transmit the video of my live surgery? Please make sure you have installed Adobe Flash Player (version 11 or later). The same can be downloaded from the Internet: http://get.adobe.com/flashplayer/. Right- click the player window and select Settings. Click the Camera in the Adobe Flash Player Settings window and choose your video capture card from the list. I had started the video transmission of my live surgery, however the video got stuck in between/ I was watching the video transmission, however the video got stuck in between. Click on Exit transmission on the flash player window. Close the flash player window where you were seeing the video. I am using LapGuru for training purpose. The quality of the surgery video on my computer is good, but the quality on the projector screen is blurred. Quality of the video on the projector depends on the quality of the transmitted video. A SD video transmission will look blurred or pixilated on a projected screen, however, if the video is transmitted in HD, the pixilation would be minimal or not there at all. What is the procedure to watch any surgery transmission of my choice? Ensure that you have installed the Adobe Flash Player (version 11 or later) on your computer/laptop. Click Play. Adobe Flash Player Settings window pops up. Click Allow. The Flash Player plays the video of the surgery that is being transmitted by the other surgeon. I am unable to watch any video after clicking on Watch Transmission button. If you are unable to watch any surgery video, please ask your network administrator to check for network connections, and Firewalls. If you have a firewall enabled on your network then the ports 1935, 554, 80. (1935-RTMP, 554-RTSP, 80-HTTP) should be opened up in the firewall. I am connected to watch a surgery transmission. However, the video quality is poor. The video quality depends on the source of the video, the bandwidth available at the transmitter end and the type of the transmission (SD, SD+, HD are the types in increasing order of quality). The quality of the video also depends on the speed of the viewer’s Internet connection (bandwidth). Typically, SD will require around 500 kbps of bandwidth, SD+ will require around 2Mbps of bandwidth and HD will require around 4 Mbps of bandwidth. If the video is getting transmitted at bandwidth higher than that of your available bandwidth, you may see a jerky or choppy video. Ideally, the viewer needs to have same download speed as that of the uploading speed of the transmitter. To check the speed of your Internet connection, please visit http://www.speedtest.net and click on Begin Test. Can I quit watching a surgery video in between? Yes. You may click on the Exit transmission on the flash player window anytime to quit from viewing the video transmission. You may click on again anytime and watch the surgery till the time the transmitter is transmitting the surgery. I clicked on Exit transmission button while I was watching a surgery transmission. Can I re-connect to watch the same surgery? Yes. You can re-connect once again and watch the same surgery. However LapGuru keeps the Watch Transmission button active only till next 10 hours of start time of surgery or till the time the transmitter has not stopped it. Can I watch a past dated surgery video? After clicking on Play on the Adobe Flash Player window, I got an error message- Shockwave Flash has crashed and can see a blank window. Such error message usually comes only when you are using Google Chrome web browser (and not in Firefox or Internet Explorer). This error comes due to the way Chrome handles Flash content. Conflicting flash installation causes crashes. Open Google Chrome browser window and type about: plugins or chrome://plugins/ in the address bar and press Enter. You can see the list of all plug-ins installed in Chrome. Look down the list of plug-ins for the Flash entry. If the entry looks like Flash (2 Files) there is a very good chance the source of your Flash-related crashes is a conflict between the two. In the upper right hand corner of the browser window there is a small button labeled [+] Details. Click on that to expand the entries for all the plug-ins. Return to the entry for Flash. 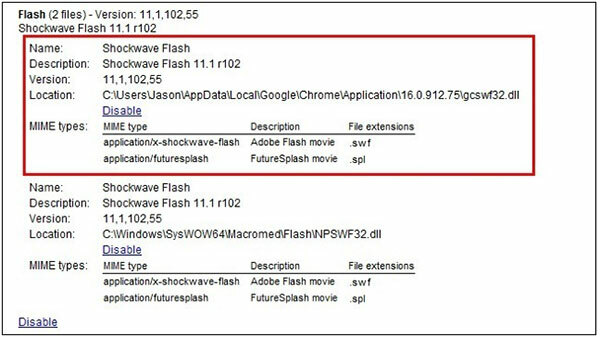 You should see something like the screenshot above: two entries for Flash, one for the internal Chrome installation (highlighted in red here) and one for the host OS’s installation (seen below the highlighted entry). Now close all the Google Chrome browser windows, and restart Chrome and go to www.lapguru.com to watch the surgery videos. Doodle is an additional feature provided in LapGuru application that enables users to point at or mark a particular section of the ongoing surgery. Through this function, users (transmitters as well as viewers) can draw an arrow mark , circle , rectangle or freehand drawing on the screen to point to a particular section during surgery and all the other attendees who have joined to watch the surgery transmission as well as the transmitter will be able to view the same on their screen. The user may click on Erase Shape to clear the Doodle marks on his computer screen. LapGuru will erase the Doodle marks in 60 seconds automatically from all viewer screens. While I was watching surgery transmission I had drawn some arrow marks and circles on the screen. However later on I clicked on Erase Shape button. Will this clear the marks on the other attendee's screens as well? No. The drawing once cleared from screen cannot be seen again. However, even though one user clears his screen, the Doodle marks which are already drawn will remain on all attendee's screens unless each user clears his screen or LapGuru will automatically erase it in 60 seconds. Infospot is a feature that enables users to add their comments (just like having an online chat) while the surgery transmission is ON. Each of these comments gets tagged to the video position when the comment was added. A button is shown to all viewers which can be clicked to go to the particular video position when the comment was added. Type your comments in the text box. InAttendees section provides a list of all the surgeons who have joined to watch the surgery transmission. Wish to become a Trainer, contribute your videos or broadcast CME workshops? Thank you for showing interest. Our Support Team will get back to you soon.